The feeling of an evolution is a constant for every artist who is pursuing the search for refinement and enlargement of his/her own means of expression. I was very much into using textures to process my images a year or two ago. I loved the painterly look that you could achieve and the soft dreamy quality of so many textured images. I’m still drawn to these images and I admire and enjoy the texture work on the blogs and sharing sites of so many artists and photographers I’ve met online. At one point I realized that I didn’t want to use heavy processing with textures as a crutch when I didn’t know what to do with a less than stellar image. So I decided what I needed to do was spend more intensive time learning and practising and honing the craft of photography — which is really what I’m in love with. I wanted to take full advantage of my equipment and make better base images — by honing key skills — exposure, composition and framing, and focus, for example. I wanted to do a better job of getting my images right in camera. I also wanted to delve deeper into the hard work of discovering and developing my own unique approach and vision. This has challenged me to become more contemplative and intentional in my image-making, as well as more experimental and risk-taking. I feel I’ve seen an improvement in my images and while many of my experiments have not seen the light of day, they have also yielded some happy results and taught me so much. And not only have I gained ground by working on simplicity, abstracts, double exposures, long exposures, ICM, etc etc etc, I’ve also truly enjoyed every moment. The more I can master the craft, the more my images will become a means for expressing myself. Over the next while I intend to continue to strive for the best image quality I can get from my camera, I also want to return to spending time refining my processing techniques. For example, I want to learn luminosity masking and make better use of Adobe Camera Raw for raw conversion. (ACR is basically the same as Lightroom, without all the photo organization abilities.) I just learned a few new ACR and Photoshop techniques from a video with Ben Willmore on Creative Live that have me quite excited. And so just for fun I hauled out my textures the other day and had a play with a few recent crabapple images. I’ve learned that when I start off with a better quality image, I am generally happier with the results of adding textures. 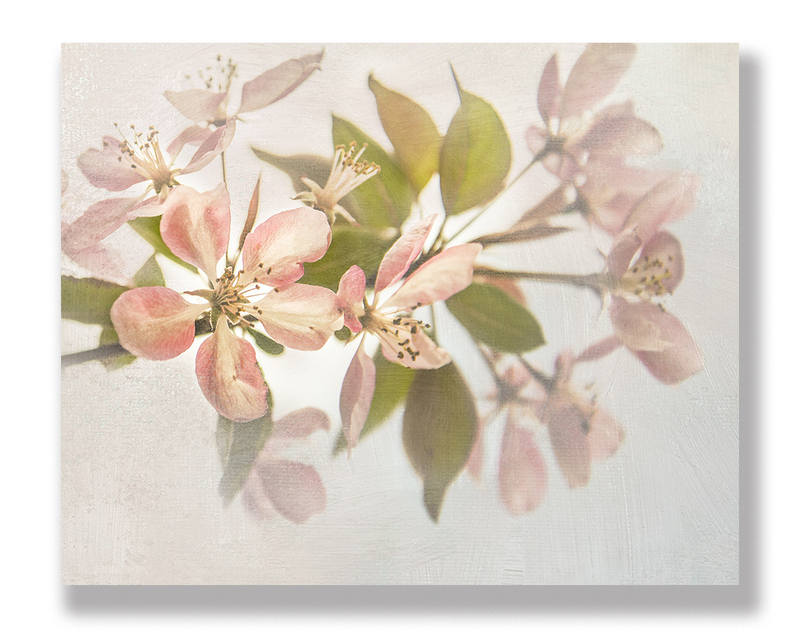 My taste is at the “less is more” stage so I went fairly light on the processing of this image to let the beauty and delicacy of the crabapple blossoms shine through. What are you refining these days? Sherry, this post could have been written by me, it parallels what I have done also. Though you may have done more experimentation in recent months compared to me, the philosophy would compare to my thoughts exactly. Bravo to you and bravo on all the beautiful developments I have witnessed in your photography. Interesting post Sherry. For me, photography is a tool for expression. Clearly mastery of technique and skill are critical, but I think true expression requires a breadth of skills that also include post processing techniques, such that the artist can end up with the result they envision. My 2 cents anyway! I am still in love with texture but with a lighter touch these days…. How lovely this is! I’ve only played a bit with texture but I’d really like to learn more. I just recently got both Photoshop and Lightroom and now I have so much to learn, I’m a bit overwhelmed! Thinking I’ll sign up for some courses this coming Fall. It is so interesting reading this, Sherry. I too moved away from textures a while ago. Wasn’t that I didn’t like the result, or that I am a purist when it comes to editing, because I actually very much enjoy the editing part (it is an art in itself), but I think I just got bored. I actually used a texture for the first time in a long time, yesterday. I think it is a good thing to keep changing and refining what you love. This is beautiful, Sherry! I, too, am basically a ‘purist’ when it comes to my photography. Textures can be fun, though, but when I use them, I tend to use them with a light touch. Good post! Good post and lovely image – I like the light, gentle touch a lot. Oh your Monday edition blossoms are so touching. This is really quite lovely and I think we all go through this and anytime we do we are better for it. I have always tried for the best image in camera, no cropping and no exposure changes if possible. It really does make a difference when you can get it right in camera. It is always an upward struggle to do so though but nothing like a challenge to keep you going I say. Sherry a very interesting and though provoking article. Your images are always stunning but I think it serves us well to evolve into our craft daily. I still struggle to find my style but feel like I’m making progress. Wish I gad more time. I love what your doing with your texture work..you always leave me with something to think about.